What They Say.....Blue skies, new love, and a glass of Bordeaux . . . what could possibly go wrong? 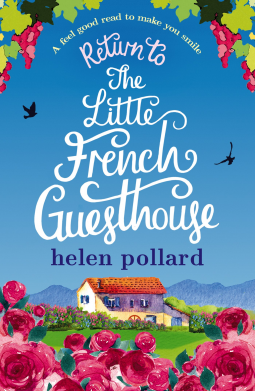 What I Say....I loved The Little French Guesthouse, so I was excited to see there was a sequel. I had just finished reading Behind Closed Doors, which was completely stressful and scared me out of my mind, so it was perfect timing to have a relaxing read. Emmy has moved to France to pursue her new career as the manager of La Cour des Roses, helping Rupert recover from his wife's sudden departure (with Emmy's boyfriend). The job is a little more involved than she expected, especially when she finds out that they have a large anniversary party coming that they knew nothing about. The guests bring their own set of issues - and embarrassments for Emmy and Rupert to deal with, all while dealing with a new romance for Emmy and Rupert's broken heart. We got to know the supporting characters a little better this time around, and I kept waiting for the realtor and Rupert to get together - maybe the next book? This is just plain feel-good, chick lit. The book that you curl up under a blanket on a Sunday and read, read, read. Total relaxation.